We love magnesium in the Emergency Department. It’s been said that magnesium is second-line for everything (kind of like doxycycline). But what about rate/rhythm control in atrial fibrillation (AF)? The 2014 AHA/ACC/HRS guideline for the management of patients with AF doesn’t mention magnesium at all.1 Dr. Josh Farkas (@PulmCrit) wrote about magnesium infusions for atrial fibrillation and torsade last year. His post looked at its use for cardioversion, rhythm-control, and rate-control in critically-ill patients. Our post will focus specifically on the IV magnesium data for rate-control in ED-related settings. 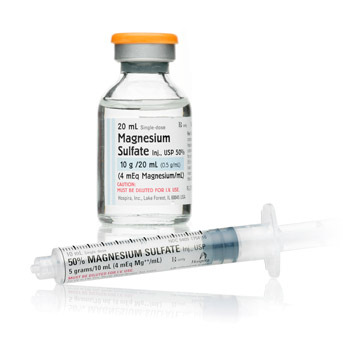 Over the years, IV magnesium has been studied for the treatment of rapid AF in several clinical situations, most prominently in post-cardiac surgery patients. However, there are also studies in ED and cardiology patients, both as a primary therapy and as an adjunct. In fact, two meta-analyses from 2007 evaluated the data (mostly the same studies).2,3 Both concluded that magnesium is safe and effective in controlling ventricular rate in rapid AF compared to placebo, the latter in patients also receiving digoxin. A closer look at the meta-analyses reveals that the positive rate-control effect for magnesium seems to be driven by the placebo-controlled trials.4 Similarly, the positive benefit of magnesium in rhythm-control is largely derived from trials versus placebo or traditional rate-control medications (e.g., beta-blockers or calcium channel blockers) rather than amiodarone or other rhythm-control agents. Of the 11 studies cited in the meta-analyses, only five reported rate-control data in ED-related settings. One ED trial has been published since the meta-analyses.10 Twenty-four patients were randomized in a double-blinded, placebo-controlled fashion to receive either magnesium sulfate 2.5 gm (10 mmol) IV or 0.9% saline over 15 minutes. The heart rate decrease across time did not differ between groups (p=0.124). Greater decreases in heart rate throughout the 24-hour study period were achieved with the addition of magnesium. This is important because it may not be immediately evident during an ED stay if magnesium is helping, especially when using digoxin which takes longer to work (sometimes several hours). The most common AV nodal blocking agent in the study was digoxin. This is not reflective of general practice in the U.S. It is encouraging that in patients who received diltiazem or beta blockers, there was not an increased risk of bradycardia or hypotension. We need a study with magnesium + the AV nodal blocking agents used in the U.S.
Based on the available data, the magnesium dose should be 2-4 gm IV over 15-30 minutes. Repeat boluses or continuous infusions were used in some trials and may be considered. To keep intracellular magnesium levels higher, infusions are theoretically necessary. But, it may not be logistically feasible to maintain a continuous magnesium infusion in the ED, especially considering there is not much available supporting data. The primary adverse effects of IV magnesium administration across the trials were flushing and slight hypotension. All reactions were mild and self-limiting. Hypomagnesemia is often found in patients with rapid AF, but data is conflicting on whether the magnesium level matters.12,13 One study found no difference in magnesium’s effect on heart rate between magnesium deficient and non-deficient patients with rapid AF. Magnesium seems to be safe and moderately effective for reducing heart rate in rapid AF. Even in the studies where magnesium was less effective than an active comparator, it still demonstrated some reduction in HR. Therefore, it seems reasonable to consider administering magnesium 2-4 gm IV as an adjunctive therapy while you are choosing between a calcium channel blocker or beta blocker as the primary rate-control agent. In some cases, you may find magnesium is enough to achieve lenient HR goals (ie, < 110 bpm). Monitor HR and BP appropriately.